f u n c t i o n | 07 :: 2007 september 21-23 :: budapest hungary :: táncolni lehet. 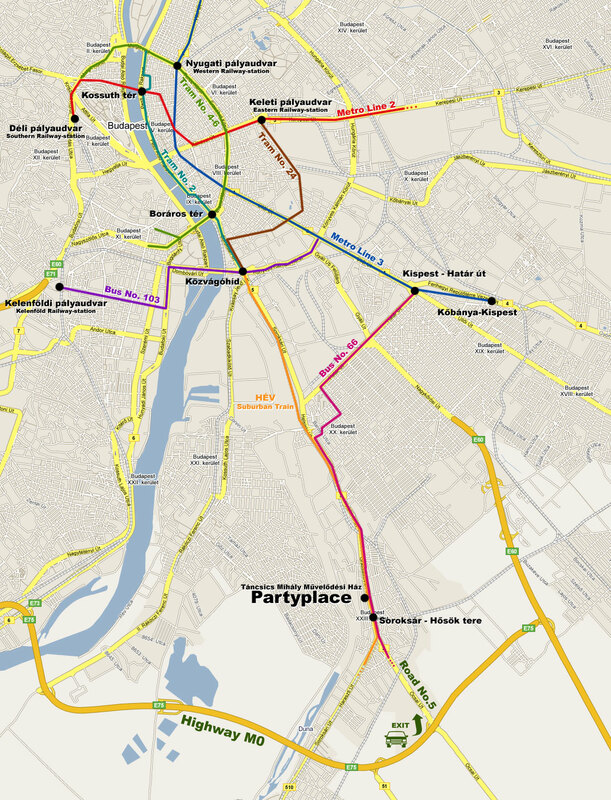 Getting to the partyplace is easiest with the suburban train ("HÉV") to Ráckeve, which starts from the Közvágóhíd (the Pest-end of the Lágymányosi bridge). You have to get off at the stop called Soroksár - Hősök tere, where every train stops. After getting off the stops, you have to go back ca. 300m-s, you can find the place at the other side of the Grassalkovich street. You can buy traintickets from the conductor on the train. 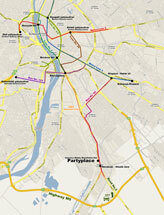 You can also reach the place from the Határ út stop of the (blue) Metro no. 3., using the bus no. 66 or red 66. (The red one is a faster one so it's advised to choose that if available.) You have to get off at the stop named Hősök tere. Warning! Since in the last two years, many people failed to avoid this pitfall, we'd like to point out that there are multiple squares in Budapest with the name "Hősök tere"! The one you need to reach is the one in Soroksár! Get on the metro and go to Kossuth tér. Change to tram no. 2. towards the Közvágóhíd (last stop). Warning: The no. 2A is only going to the Boráros square, so don't go by that. Here you can transfer to the suburban train and go to the stop mentioned above. Next to the station you can find the Festetics György street, which is one of the terminals of the tram no. 24. Get on it and travel to the other terminal which is the Közvágóhíd. Here you can transfer to the suburban train and go to the stop mentioned above. Get on the metro and travel to the stop named Kispest, Határ út, which is the last stop before Kőbánya-Kispest. Transfer to the bus no. 66 or the red no. 66 and travel to the stop named Hősök tere. This might take 20-30 minutes, depending on the traffic. Get on the tram either no. 4 or 6 towards the Boráros square, then at the square, transfer to the tram no. 2. towards Közvágóhíd. Here you can transfer to the suburban train and go to the stop mentioned above. Get on the bus no. 103. which takes off from in front of the station. Travel to the Lágymányosi bridge. This is essentially the same stop like the Közvágóhíd for other buses. Here you can transfer to the train to Ráckeve and travel to the Hősök tere. People coming to the Déli station might want to consider getting of the train at Kelenföld, since you have to transfer less this way. After landing at the airport (find a flight), take the dedicated bus from the airport and get off at the last stop (Kőbánya-Kispest). Travel one stop with the metro to Kispest, Határ út, then transfer to either the bus no. 66, or the red no. 66 to the stop named Hősök tere. If this is too contrived to you, then either check the BKV site for more details or route-planning, or contact the organizers and we might be able to support you with someone who can guide you thru the city. If you want to go to the partyplace by night, you might try the no. 966 midnight bus. If you come by car, the easiest way is if you take the M0(E75) highway, and take the exit at road no.5. Drive cca. 2.5km heading north and you're there. The closest hotel to the partyplace is Hotel Frankfurt, which is on the same road as the partyplace (in fact the continuation of it).